The Trapeze Support Channel (IC/CNL/D) provides a versatile means of installing Speedway Cable Ladder and Cable Tray using a trapeze support arrangement. Based on slotted deep channel (strut type) to BS6946, the Trapeze Support Channel has 26 x 13 slots at 50mm pitch and is suited to either M10 or M12 threaded rod hangers. 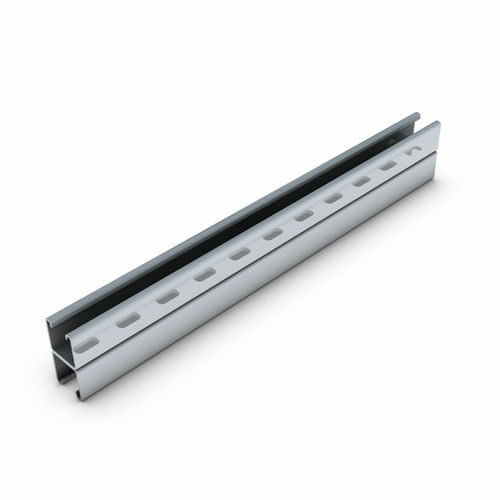 The slotted deep channel is supplied to an exact size to suit each width of Speedway Cable Ladder or Cable Tray and has the slots arranged uniformly along the length of the channel to simplify installation. The continuous open slot on the trapeze support channel facilitates the use of Speedway External Flange Clamps (SW/EFC), Adaptable Fixing Brackets (SW/AFB) or Hold Down Brackets (SW /HDB) for securing the Speedway Cable Ladder or for Cable Tray is suitable for use with the tray hold down bracket (HDB) or for direct fixing through the bed of the cable tray using conventional M6 channel nuts. The tables below give installation details as well as the recommended maximum load for each size of trapeze support channel when used with Speedway Cable Ladder (which should be uniformly loaded to apply two equal point loads onto the ladder trapeze hanger) and Cable Tray (which should also be uniformly loaded).